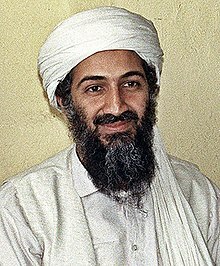 Usāmah bin Muḥammad bin `Awaḍ bin Lādin (Arabic: أسامة بن محمد بن عوض بن لادن‎; born March 10, 1957, died May 1, 2011), most often identified as Osama bin Laden, Usama bin Laden, Osama, or bin Laden, was the founder and former leader of al-Qaeda. The Banishment of Communists from the Arabian Peninsula, July 11, 1994. United Nations Security Council Resolution 1333, December 2000 resolution which condemned Afghanistan for harbouring bin Laden. This text was published by, or on behalf of, a "designated terror organization" subject to U.S. sanctions under the International Emergency Economic Powers Act (IEEPA, 50 U.S.C. Chapter 35). As such, any corresponding copyright is "blocked property" in the United States. The text is used on English-language Wikisource (hosted on servers in the United States by the non-profit Wikimedia Foundation) as "information or an informational material" under the the provisions of 50 U.S.C. § 1702(b)(3). Note: If the organization responsible for this particular text is ever removed from the list of IEEPA-sanctions then its suitability for Wikisource will have to be re-examined and it may face deletion. This page was last edited on 23 June 2018, at 13:22.